Why blue lilac hairpin? Thought the idea was to make fourth of July hair accessories? We know there should be at least one blue star included in our hairpin. But....we are making accessories for the girls. We want it to look nice and pretty. It's obvious that you need the hairpin :) and jewelry tools. At least you have the cutter to cut the pin. And, yes! you need the silver pearl, beads or anything else to put in the center of the lilac. Also, good to invest on clay gun extruder to make nice and clean shape like the red and white stripes later on. 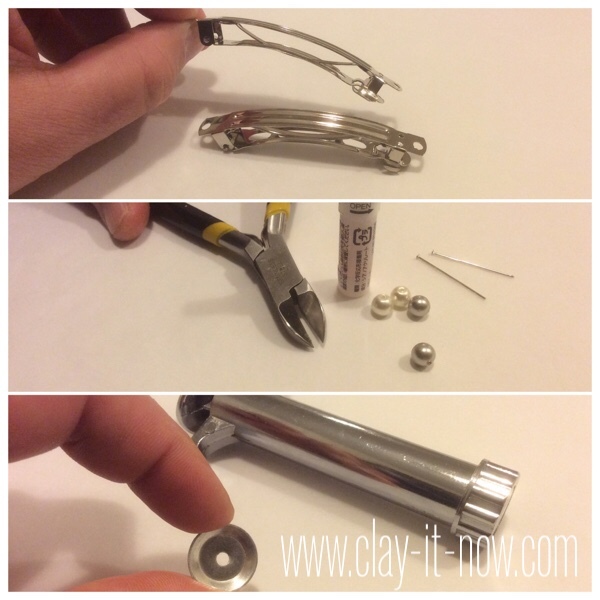 Check out our clay tools store page to find the items you need. 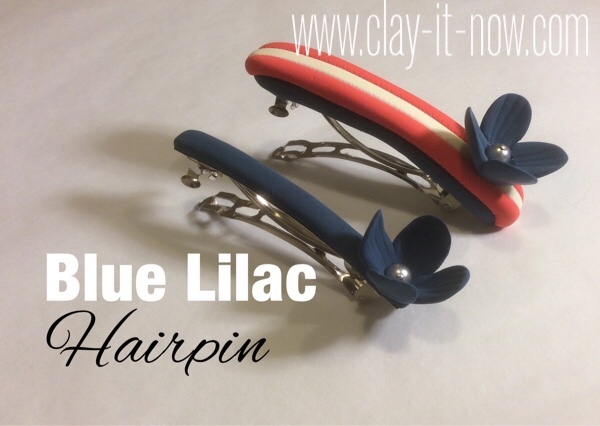 What clay to use for blue lilac hairpin? I would say that the hard clay when it's air dry or cured in the oven is best for the base of the flower. And, soft clay is nice for the lilac. 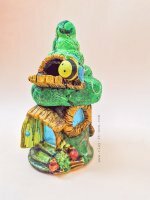 But, for this tutorial we used soft air dry clay. Hard clay: polymer clay like sculpey or FIMO and Makin's air dry clay for ready-made clay or home-made clay like cold porcelain and soapy clay. Soft clay: Martha Stewart clay, cloud clay, hearty clay or even Crayola magic clay. 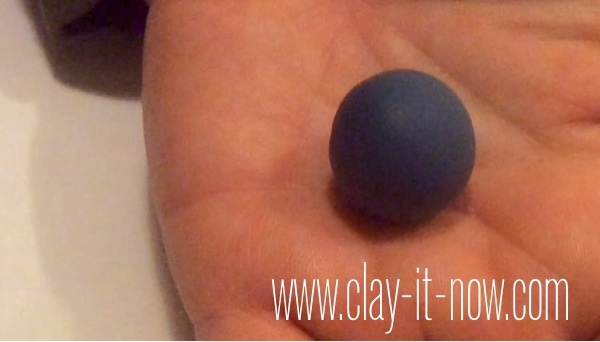 Please visit our "what clay to buy" and modeling clay recipes page for details. Always start with kneading and shaping the clay to a ball shape. From a ball shape, make a short pipe shape and flatten it with your rolling pin. 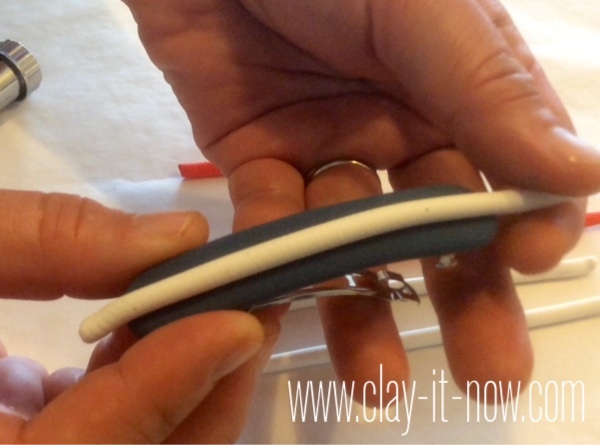 Use glue to paste the clay ((we used air dry clay here)to the hairpin, and reshape it. We make 2 type of hairpins, the slim and broad base pin. 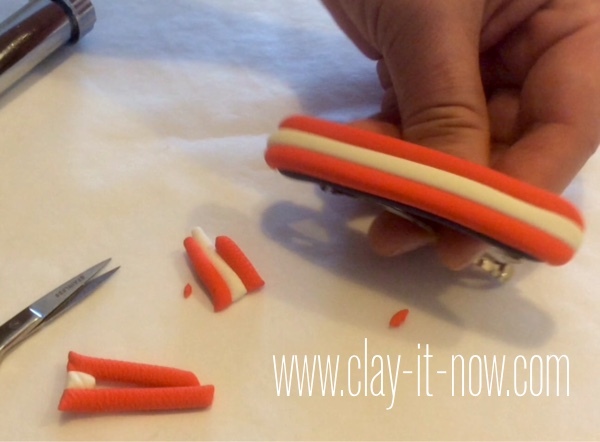 Use your clay gun extruder to make red and white stripes in the same diameter. 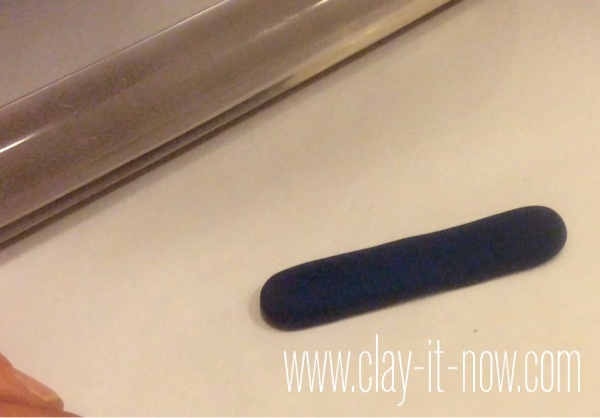 Paste the stripe to the center of the clay base and other colors to the left and right side. 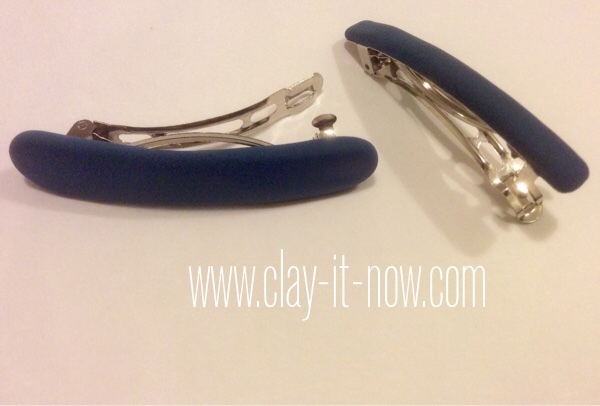 Cut the clay at both end of the hairpin and smooth the edges with your fingers. For the flower, again start with small ball shape then change the shape to teardrop. Cut the top part to two sections and then 4 sections. 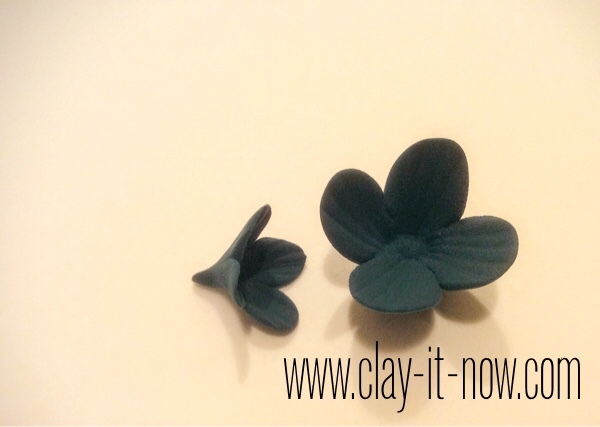 Use your clay tool to refine the petals. 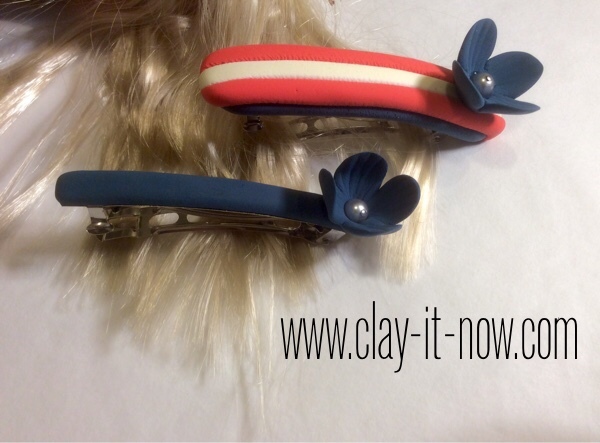 Our hairpin colors look stunning for light color hair. Please feel free to change the color to suit other occasions and hair colors if you want. We would love to see your creations if you've done that. Please submit your pictures and story using the submission form below. If you would like to see our video tutorial for this craft project, we have it at You Tube. 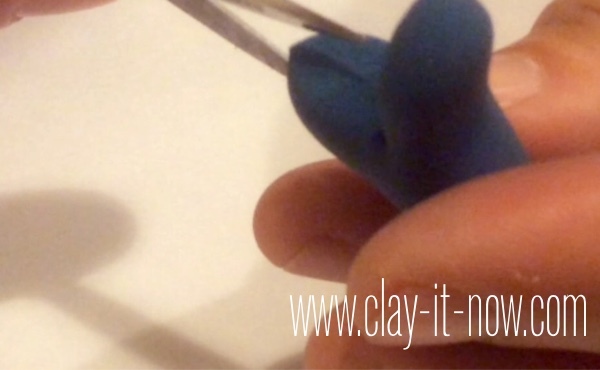 Please subscribe to Clayitnow channel for upcoming video tutorials.